Actuaries rely for their projects on vast reservoirs of news,articles,blogs and other online sources. Because of the dfficulty of properly searching, finding and assessing these unstructured data actuaries may not draw upon these vast reservoirs of information. This can ultimately lead to poorly-informed decision making or falling behind in knowledge. 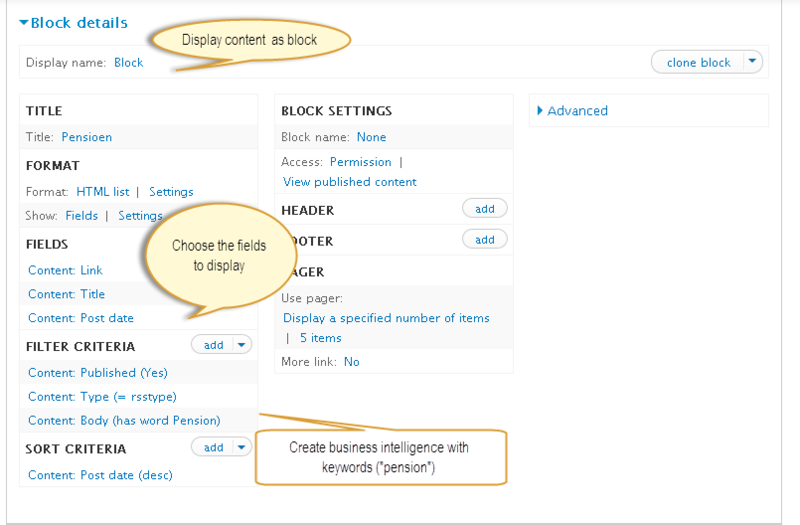 In this article I'll describe how to add a news section with Drupal Feeds that collects (business) information from different webresources and filters the information that contain specific (actuarial) topics. Subsequently the filtered information is subdivided in different categories. This ensures that the information is clearly presented and easily accessible. Create a list of interesting RSS feeds. 1) Body. The body field will be mapped to the RSS content. 2) Rss_Link This field will containt the url of the (news) article. a) Add a Feeds importer for each feed you've defined in step 1. Go to "structure", choose "feeds importer", insert a name, and save. The most important settings are related to the processor in which we have set the content type to use and the mapping of the rss fields to the node fields (see also step 2). If the configuration has been successful then the rss will be imported as nodes of the type "rsstype".